We all act a bit differently when backed into a corner, some run, some go silent, and some might lash out. Each person is going to respond differently in order to defend themselves, and no choice is really right or wrong. 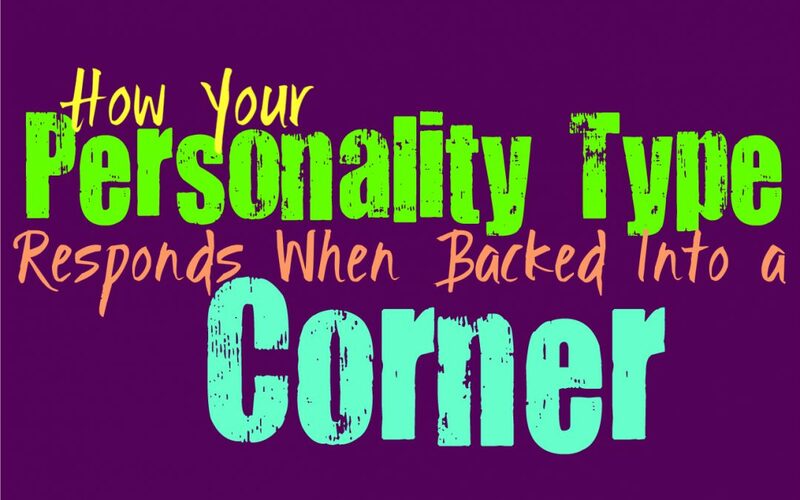 Here is how you respond when backed into a corner, based on your personality type. INFJs are often considered caring and compassionate people, but they can certainly change when they are backed into a corner. If they have tried to smooth things over and make the situation easier, INFJs can certainly get a bit vicious if someone has them backed into some sort of corner. If they are clearly being attacked and see no way out of the situation without discord, then they aren’t afraid of lashing out. The INFJ who is backed into a corner is definitely a bit intense and even frightening for those around them. ENFJs are compassionate people who do a lot for others, but that doesn’t mean they handle being backed into a corner all that well. They can become a bit intense when someone has pushed them far enough, and aren’t afraid of defending themselves. Most of the time ENFJs want to make things calm and safe, and so they try to avoid too much discord. They don’t want to have trouble with people and are often great at calming a situation and getting along with others. When the ENFJ is pushed and realizes they cannot make things right, they are often a bit vicious towards someone backing them into a corner. INFPs usually don’t like confrontation and would rather avoid people who bring negativity to their lives. They don’t want to deal with someone who is going to push them and make them feel bad about themselves. When the INFP is backed into a corner they can sometimes shut down and feel like they are someone else completely, or they might find a way to slip out of the situation. If they have no choice but to face what is in front of them, they can get a bit sharp when they are defending themselves. ENFPs don’t like being backed into a corner at all, and will do whatever it takes to get themselves out of these situations. Most of the time their sense of charm can help the ENFP keep a situation from turning into too much intense confrontation. They really don’t like discord and will do their best to avoid situations that go too far like this. When someone does back them into a corner ENFPs often know the right words to tear that person down, and make them take a step back. They don’t like doing this and it really requires them being pushed far enough to feel it is necessary. INTJs often avoid having their backs against a wall, instead they find ways to keep themselves at much higher ground. INTJs don’t like allowing someone to push them into a corner or make them feel like they need to lash out to defend themselves. They often prefer to be a few steps ahead so that this doesn’t actually happen. If sometimes does end up backing the INTJ into a corner, they find a way to find and get themselves where they belong, no matter what that means. ENTJs usually strive to stay one step ahead, and so they don’t often find themselves backed into a corner by others. They are always aware of their surroundings and do their best to keep focused on the future. While ENTJs are definitely good at avoiding situations where they aren’t prepared, they are capable of adapting if things don’t necessarily go how they want. If the ENTJ does end up backed into a corner they will do whatever it takes to claw their way out, even if that means being a bit vicious in some ways. INTPs often do their best to avoid being backed into a corner, especially when it comes to their relationships. When they feel trapped they often work to find the best way to escape, and will do their best to be strategic about it. INTPs don’t like letting themselves get into situations where someone can back them into a corner, but at the same time they often feel mentally prepared for these situations. INTPs aren’t afraid of calling people out and making them realize that they won’t put up with their actions any longer. They often cut people out of their lives who put them in these situations and so they won’t want to maintain those relationships. ENTPs don’t usually let themselves get into situations where someone can actually back them into a corner. Instead they do their best to prepare for most situations and will avoid allowing this to happen. ENTPs prefer to be capable of getting out of situations and so they can often find the solution to being backed into some type of corner. They know how to get out of these situations without creating too much discord if they need, since they do have fairly charismatic personalities. ISTJs don’t like getting backed into a corner, and so they do their best to avoid this situation in the first place. For ISTJs it is important to stand their ground and make their boundaries very clear to people. While they are more focused on prevention and preparation, that doesn’t mean they cannot respond accordingly. When someone does back them into a corner they do their best to stand up for themselves and fight against whatever is happening. ISTJs aren’t afraid of confrontation, and so they are often good at breaking things down and making their presence known. ESTJs are definitely not afraid of confrontation, but they can react rather intensely when being backed into a corner. When someone does put the ESTJ in this type of position they can become aggressive in order to defend themselves. They don’t like when people try to push them around or control them, and will definitely fight back. ESTJs can be pretty intense people when they need to be, especially if someone is trying to push them around in any way. ISFJs often try to avoid confrontation and make a situation more comfortable. When someone tries to back them into a corner they will often try to smooth things over. They want to make their loved ones happy and do their best to be someone others actually like. So when someone is being confrontational with the ISFJ they do their best to understand why and make the situation better. It takes a lot for the ISFJ to feel pushed over the edge, but if it does come to this they certainly won’t be afraid of defending themselves. ESFJs often do their best to avoid confrontation and avoid being backed into a corner by someone. They try to always stay ahead of things and work to be prepared for the sake of their loved ones. ESFJs are also good at getting along with people and will strive to make things right if there is tension. If there is nothing they can do and someone does wind up backing the ESFJ into a corner, they will be a bit more vicious than most people might expect. ISTPs don’t often allow themselves to get backed into a corner, mostly because they prefer their freedom. When someone tries to control the ISTP it can cause them to feel very frustrated and trapped in a way that they don’t appreciate. They will often do whatever it takes to slip out of this situation, often before someone even realizes what has happened. They don’t really enjoy having to face confrontation with someone like this, instead they want to separate from them entirely. When someone backs the ESTP into a corner they can become truly defensive and even a bit malicious. They don’t like being pushed in this way and so they do whatever it takes to escape the situation they are in. When the ESTP feels threatened they want to find a way to fix this and get away from that feeling. They will lash out a bit, and sometimes in a way that can be truly hurtful. It takes the ESTP being pushed for them to do this, but they aren’t afraid of hurting someone’s feelings. ISFPs do get upset when they feel pushed or backed into a corner, but they don’t like feeling the need to lash out. ISFPs often go inward when they are backed into a corner, and try to find a place inside of themselves to escape. They have strong inner emotions and powerful morals, and in most situations they don’t like being forced to defend themselves. ISFPs would rather get away from someone who seeks to control them, instead of having to confront that person. While ESFPs don’t enjoy confrontation, they certainly won’t allow someone to back them into a corner. When they feel trapped or like someone is taking advantage of them, the ESFP will definitely lash out a bit. In some cases they might become emotion and upset, in hopes that the person actually cares and will back down. If that doesn’t work the ESFP will realize this person doesn’t care, and they won’t want to waste their time sharing their feelings with them.